A state prison inmate wrote me for help proving that the legislature did not properly enact the Florida statutes because of omitting the Be It Enacted clause. I wrote today this in response. Any comments? It seems clear to me that you do not understand how the Florida Legislature creates laws and statutes, so I shall explain. The legislature enacts laws using the proper language “be it enacted” and records them in one of the chapters of laws, identified by year and chapter number. The enactment authorizes severance of the laws into statutes according to topic category. The laws changing the statutes specify the statutes upon which they operate and provides the exact wording for deletion or addition to those statutes. The statutes then contain a footnote identifying the source laws, including the section number, and the Law year and chapter number. With respect to the loyalty oaths about which I raised such a stink, the Supreme Court justices asked the Legislature to modify the law to make better sense. The legislature responded in Law 2011-40 which modified 876.05-876.10, the main loyalty oath statute and all. In particular, they removed the provision requiring candidates to swear the oath. 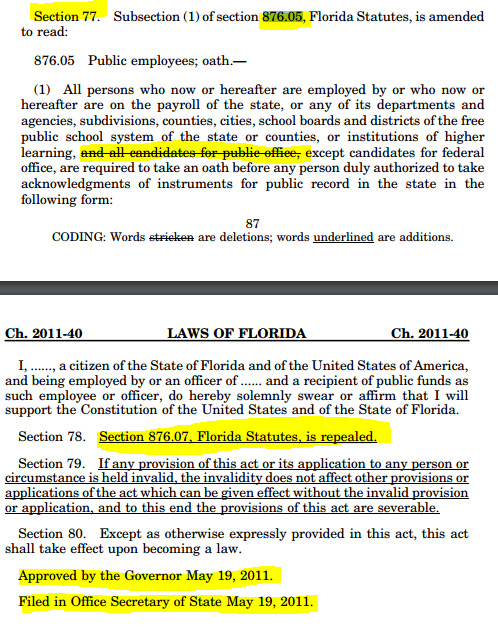 The most recent of those changes came from this Laws of Florida document posted on the web: http://laws.flrules.org/2011/40. The law document contains a summary of all the statutes it changed, added, or deleted, followed by the enactment language followed by the specific changes, as above. I searched for all instances of 876.05, the loyalty oath statute. The law mentions it 7 times. Here is one of them. 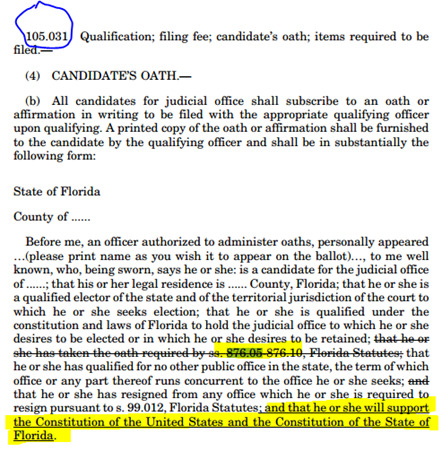 Notice that while striking 876.05-876.10 from the candidate’s oath, the law added separate language with the same effect as that struck. So the legislators are not idiots, are they? They agree that candidates should swear to support the constitution BEFORE getting elected. Please look this law up for yourself and share it with your inmates in a lecture. They need to know how government PROPERLY creates and changes laws and statutes and how it documents them for the public to read. Show them this letter if you wish. Remember that the law is based on reason, logic, and common sense. Stay away from patriot myth mongers who claim secured party creditor status, claim all law is commercial or in admiralty, advocate harassing officials with spurious civil liens and administrative process, advocate passing false financial instruments, such as birth certificate bonds based on non-existent treasury direct accounts, or promote wrongful use of IRS tax forms. These people get others thrown in prison (just ask around and you will find plenty in a federal prison). Now I’ll mention a bit of news. A few months ago, Terry Trussell of Dixie County got convicted of numerous counts of violating 843.0855 by issuing a presentment as foreman of a “common law grand jury.” Common sense says the government will NEVER allow people to establish their own grand juries, and if people do that, and issue presentments, they will go to prison for impersonating government officials. But I know of no law making the grand jury (see chapter 905) part of government, albeit the chief judge, the clerk, the bailiffs, and the state attorney have intimate involvement. I noticed that ante-bellum juries had more powers than post-bellum juries. Petite juries determined law as well as fact, and grand juries investigated and presented or indicted on all felonies. Furthermore, crime victims could hire private attorneys to prosecute the accused. After the civil war that changed dramatically. Now 2 states don’t even have grand juries, and in Florida they investigate only capital crimes. Petite juries determine only facts, but not the law. As I contemplated the reasons for this, I realized that the governments of the states simply did not trust the electorate any more. Why? Because the 15th Amendment gave Negroes and other non-whites the right to vote, and therefore to sit on juries. Negroes then committed many crimes, just as they do now, only worse, because of low average intelligence and bad decision-making. Government leaders apparently believed that Negroes on juries would acquit members of their race regardless of guilt. So they stripped juries of some powers. And so it remains. The 19th and 26th Amendments gave voting rights to women and children, so the situation has become even worse. I proposed a solution: deny voting rights to irresponsible people regardless of race, gender, or age. One measure of responsibility is graduating from high school. Another is having adequate knowledge of the constitutions. Another is self-sufficiency. Another is mental maturity. You might work with your fellow inmates to propose legislation that will repair the electorate, making it more responsible, and then to restore jury powers and the right of private prosecution of criminal defendants. Point out to your associates that many people sit in prison because of their politics (including substance abuse), not because they actually hurt anyone. Properly empowered juries would prevent such wrongful incarcerations. But that will not happen till we have a responsible electorate, will it? So, how do you make the electorate responsible? If that project doesn’t interest you, you might use your time to memorize the Florida Evidence Code (chapter 90 and 92, Florida Statues) and the Florida Rules of Civil Procedure, Criminal Procedure, Appellate Procedure, and Judicial Administration. Remember that “good luck” happens when preparation meets opportunity.